Navigation Home About — About — Contact — Frequently Asked Questions Resources — Find Your Personal Style e-course — The Mighty Artist *new* — 1000 things to draw — Good to Know project — My library Shop Work with me! Drawing can be dangerous. 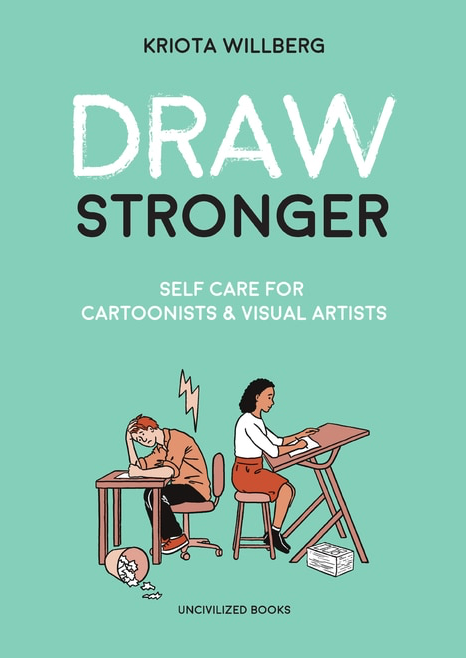 Just ask Kriota Willberg, author of the book Draw Stronger: Self-care for Cartoonists & Visual Artists. 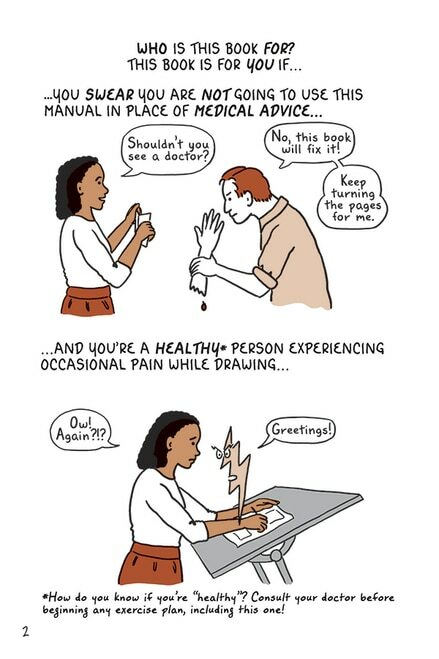 She draws from decades of experience as a massage therapist (for over 30 years) and educator in health sciences and the arts, which culminated in this very niche book – a guide to injury prevention for cartoonists and artists. I did some background research on Kriota and found this podcast at Comics Alternative which was really informative. I learned that she was a guest faculty at the centre for cartoon studies one year. And there, she realised how students would draw with sketchbooks in their laps, even if there was an easel or table. They would be curled into a fatal position or hunched, not realising the detriments of a bad posture long term since they were all new to the field. She was concerned about soft tissue injuries and repetitive stress injuries because as a massage therapist who specialised in orthopaedic injury, her day job was in addressing repetitive stress injuries in variety of different context day in and day out. 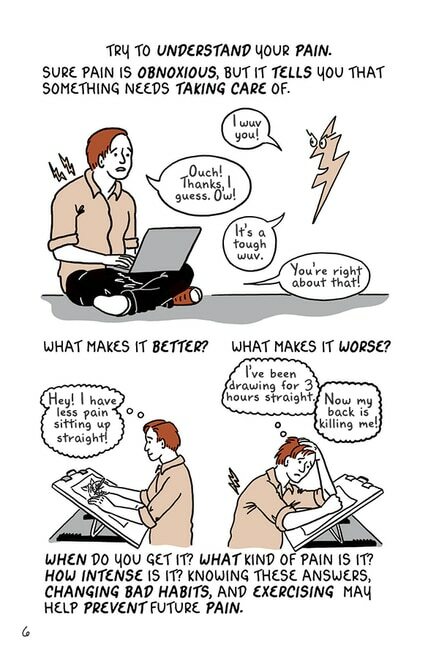 She then tried to do more research online – trying to find resources for cartoonists and artists about injury prevention, in the context and scope that she wanted. She couldn’t find much about it, and so she took it upon herself to put it out there. That’s just a small part of it. Because the book, as it turned out, wasn’t as comprehensive in the beginning. What you see now (a 136-page book) started out as a 60-page mini comic called No Pain that she passed out to her students who were drawing for class. It was about the immediate basics. Within the next couple of years, she added First Aid for Drawing Injuries. And then 40-page comic on back pain. She then decided to look for a publisher because “stapling 60-page comics is really hard on your hands.” And when she was putting together all the materials for the book, she added a few more smaller chapters to it to round it all up nicely. My favourite chapters in the book were the ones with various exercises that an artist can do to help counteract the many hours spent in the same position during the creation of their work. She covers hands, wrists, neck, chest, shoulders and back – all illustrated in great detail – and I find myself mimicking all the exercises she recommends just to test if I was as mobile as I should be. I really liked the format of the book. It’s small, light and easy to carry around (which harked back to Kriota’s purpose – she actually wanted it to be smaller!) 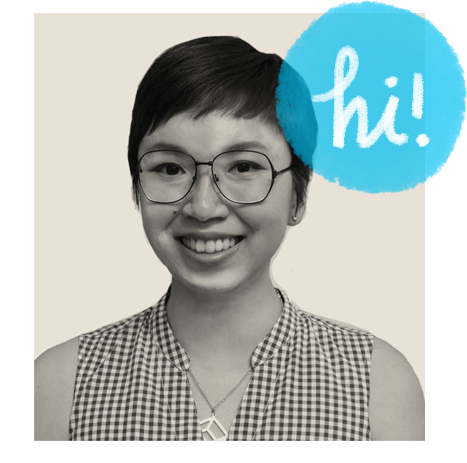 I’ve always been interested in body, muscles and movement – I’m that geek who used to go to the library to read up on books on massage, physiology and dance while I was training as a landscape architect. I thought the book is really comprehensive. It doesn’t merely cover a lot of dos and don’ts, but it also tells you why. It illustrates this by diving deeper into anatomy and how the body works too. I really liked the limited color palette and how the illustrations helped to highlight the ideas/advice that Kriota puts forward. I thought that the niche that Kriota picked is really great – there’s a lot of information here that would benefit artists (who are different from other professionals) in how they work from day to day, and I’ve never come across a book that addressed this concern specifically, which is a huge yay. The heading font for the book is a special hand-written font that Kriota created, which really adds character to the book. However, because the hand-written font is mostly uppercase, the text looked blocky (plus, the body text and heading were of the same size on the same page) and sometimes made it difficult to focus because of a lack of hierarchy. There was a lot of great content (text + illustrations), but for me it felt like a lot of the information blurred and blended into one another as though there wasn’t much breathing space. But I understand that it’s not easy to pack the amount of information she did into a small book, so it was just a small (and totally ignorable) gripe of mine. I would highly recommend this book for artists and illustrators. In fact, I think it’s required reading for artists at any stage of their career – Kriota brings a wealth of knowledge and experience that benefits a lot of those who are seeing signs of strain and injury in the course of their creative work. She’s very specific in terms of who will benefit the most from it (not mural artists who work on large artworks etc, but people who draw at a desk who work on small pieces), and thus have gone really deep into this subset of audience. I believe that prevention is always better than cure, but unfortunately I think those who find the book will be those who are already noticing the toll it has taken on their bodies. To learn more about Kriota Willberg, head on over to her blog. Thanks for another excellent post. The place else may just anybody get that type of info in such an ideal way of writing? This design is incredible! You obviously know how to keep a reader entertained. Hi there and welcome to Pikaland! I teach online workshops for artists & illustrators, and create goodies to expand your creative horizons. Enjoy! All images are subject to copyright by their respective owners. 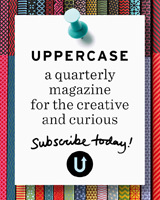 Please be courteous and add their names when you share their work (i.e. on Pinterest!) It would make me really happy if you could link back to Pikaland when you blog about stuff you saw over here too. Thank you! Navigation Home About – About – Contact – Frequently Asked Questions Resources – Find Your Personal Style e-course – The Mighty Artist *new* – 1000 things to draw – Good to Know project – My library Shop Work with me!